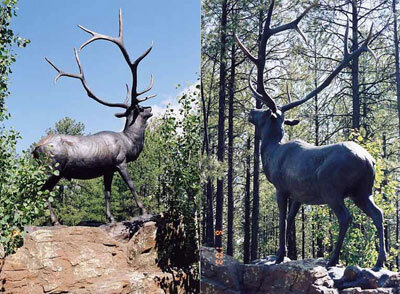 Mark Rossi, Bull Elk, Bronze Edition of 10, 138" x 108" x 60"
Mark Rossi's continued interest in nature and art emerged at an early age. His love of the Southwest was deeply affected by his mother's Apache, Pueblo, and Spanish New Mexican heritage and the traditions she instilled. When Mark Rossi was ten, he began observing his father, prominent Western artist and former Gilcrease Museum of Art director, Paul Rossi, as he worked in his studio and foundry. The artists, conservators, and historians who frequented the museum inspired his artistic pursuit. Mark Rossi went on to study at the University of Tulsa and at the University of Arizona in Tucson. 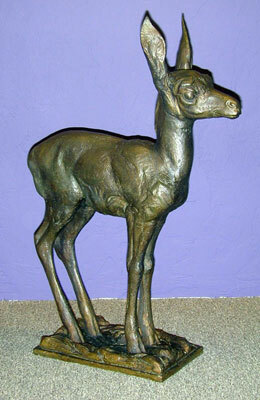 Mark Rossi, Antelope Fawn, Bronze Edition of 27, 27" x 20" x 8"
Living for many years at the base of the magnificent Catalina Mountains north of Tucson, Mark Rossi studies desert plants and wildlife while hiking and riding horseback in the hills and ravines. In the tradition of early pilgrimages and journeys through the Southwest, his solitary travels are a spiritual meditation. Mark Rossi knows the bajada well, that weathered slope at the foot of the mountains. In the rocky soil grow the saguaro cactus, palo verde, mesquite, and the most tenacious of all, the creosote bush. The earthy smell of creosote after a summer monsoon has no equal. Heard always are the songs of the white wing dove and Gamble's quail. Cottontails and blacktail jackrabbits, coyotes, white-tailed deer, and bighorn sheep graze the rocky slopes of Pusch Ridge. With humility and humor, Mark Rossi allows the viewer to observe a quiet moment in the life of the subject he sculpts. 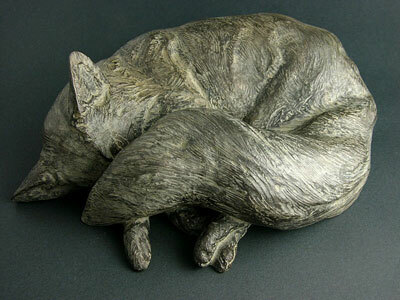 "Although my work is realistic, I'm not interested in sculpting copies of nature. I've become more relaxed and learned to let the materials show me what they can do. I want to allow the form to emerge from the clay and metal. Cast bronze is an extremely plastic and durable a medium to work with." 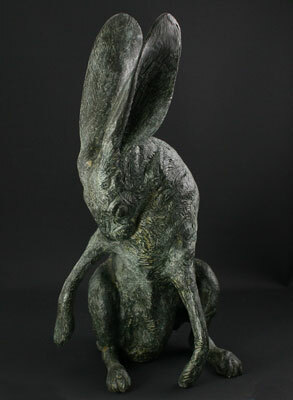 Run your hands over the surface of Mark Rossi's bronzes; the details made by his hands and tools are evident. 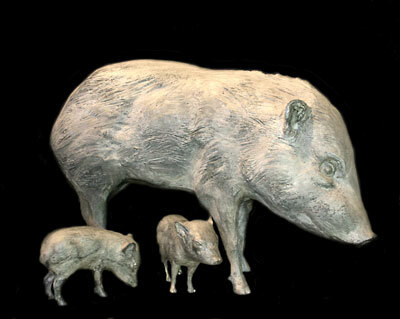 Mark Rossi, Jackrabbit Grooming, Bronze Edition of 27, 18" x 9" x 9"
Mark Rossi, Female Adult Javelina Standing, Bronze Edition of 10, 21" x 32" x 10"
Newborn Javelina Pose #6, Bronze Edition of 35, 7" x 10" x 3"
Newborn Javelina Pose #9, Bronze Edition of 35, 6" x 9 " x 4"